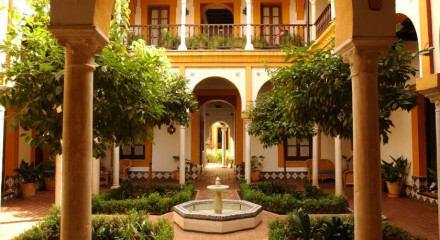 City Breaks - Enjoy a short break to Casa No 7 - a small boutique hotel in the centre of Seville with a touch of luxury, warm welcome & the perfect location for sightseeing or nightlife. Book 2 or 3 nights B&B and save up to €111. Breaks start at only €300 per couple for 2 nights. This 19th-century townhouses' style is all in little details such as furniture and fabrics from the owner's private collection. Nearby public parking costs EUR 19 per day. Check out the well-priced boutiques around Calle Sierpes, for shoes, antiques, wine and fans. 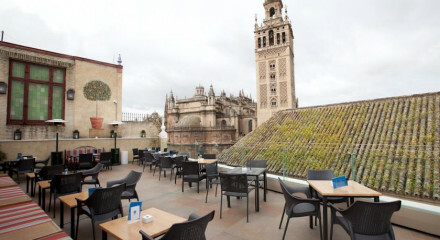 Sit on the roof terrace admiring the views and sipping on pre-prandial fino, bliss. Just a few minutes walk from Seville's main attractions- Casa Pilatos, Torre del Oro and Plaza de España. Just over a km fro the Reales Alcázares de Sevilla, the grounds of the royal palace boast lovely gardens. Take an evening stroll through the maze of cobbled alleys to find the lively tapas bars in the Barrio Santa Cruz. Casa No 7 is an elegant historic building decorated to the highest standard providing a comfortable, relaxed, friendly and luxurious place to stay. 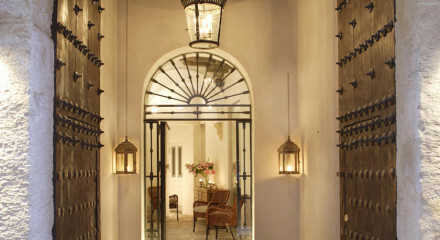 Casa Numero 7 is also located in the centre of old Seville with majority of tourist attractions within 5-15 minutes walk. We are located in Bario de Santa Cruz which is within walking distance of Casa de Pilatgos, Alcázares, Plaza de España, La Giralda, and Catedral de Santa María. We are also less than 5 minutes walk from Calle San Jose where there are many restaurants and tapas bars which are very popular with tourists and local residents. We start with a fresh orange juice, coffee or tea. We have a buffet with: different types of cereals, yogurts, dry fruit and fresh fruit, different pastries and also offer Eggs (fried, boiled, scrambled) with Bacon. The Yellow room, it has a bath and shower and also a dresser. The 1847 townhouse, stuffed with period furniture and antiques from del Río's own collection, is the best of aristocratic Spain with more than a hint of English country house.